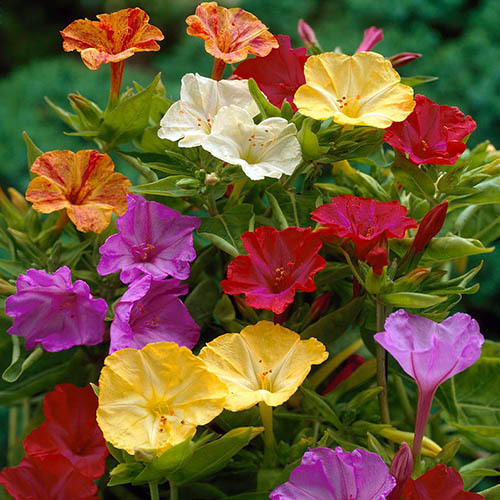 The unusual and immensely pretty Mirabilis jalapa is a must for any summer garden. Beautiful flowers open in mid-afternoon on sunny days, only to close again at night. Each plant produces its flowers in a mix of colours - magenta, white, bicolours, and even yellow! Considering all this it's no wonder its called the Marvel of Peru!! Supplied as a pack of 10 roots, ready to plant now. The unusual and immensely pretty Mirabilis jalapa opens its gorgeous flowers in mid-afternoon on sunny days in the height of summer - only to close them again at night, hence one of its common names 'The Four O'Clock Plant'.